In a year full of recognition and accolades, the all-new 2017 Ford F-Series Super Duty has won the PickupTrucks.com three-quarter-ton work truck challenge – beating out competitors from Chevrolet, Nissan and Ram. 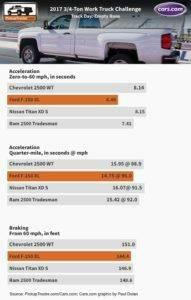 Of course, the Super Duty would beat those challengers! 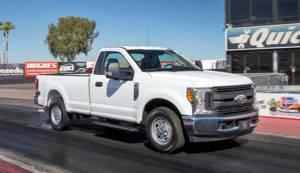 Based on a series of empirical tests conducted at Wild Horse Pass Motorsports Park in Chandler, Arizona, the all-new F-250 Super Duty XL 4×2 outscored the competition handily. Powered by the 6.2-liter flex-fuel V8 engine mated to a heavy-duty six-speed SelectShift-G automatic transmission, Super Duty led the pack in 0-60 mph and quarter-mile acceleration, 60-0 braking, maximum horsepower and measured fuel economy. The award is the latest in a series of accolades Ford’s all-new F-Series Super Duty has earned. Motor Trend named Super Duty its 2017 Truck of the Year. In addition, the Texas Auto Writers Association placed it at the top of its class at the 13th annual Texas Truck Rodeo. The recognition highlights Ford’s yearlong celebration of F-Series as best-selling trucks in America. It’s been 40 consecutive years, and 35 years as the best-selling vehicle in America. Join the #40YearsTough celebration at www.40YearsTough.com. The PickupTrucks.com three-quarter-ton work truck challenge can be found here. 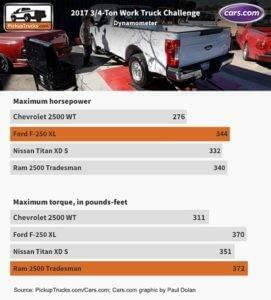 Beach Automotive Group has a really good selection of Super Duty trucks on the lot right now. You really should stop by and take a test drive. In fact, if you call ahead, we can have everything set up and ready for your arrival. Already have a particular Super Duty in mind? Give us a call today so you don’t miss your chance. Schedule your VIP Test Drive Experience today! You’ll be glad you did.